At the holy Thiruvallikkeni divyadesam, there are two Brahmothsavam – for Sri Parthasarathi in Chithirai [Apr – May] and Aani for Sri Alagiya Singar in June-July. Now it is time for Aani Brahmothsavam 2018 at Thiruvallikkeni divyadesam for Sri Azhiagiya Singa Perumal. Angurarpanam was yesterday. This morning it started with dwajarohanam; 24.6 is Garuda vahanam at 5.30 am; around 5 pm on 27.6 is Yoga Narasimha thirukolam followed by Hanumantha vahana purappadu, 28.6 evening is Yaanai vahanam; 29.6 is Thiruther; 1st July is theerthavari. In this universe - Who is the one (ekam) refuge (parāyaṇam) for all? Who (kim) is the greatest (ekam) Lord (daivatam) in the world (loke)? …. ..in the invocation of Sri Vishnu Sahasranamam is a verse which reads : Vignam nignanthi sathatham, Vishvaksenam thamaasraye.’ This verse pays homage to the commander-in-chief of Sri Vishnu’s army – Sri Vishwaksena – who controls the several two-tusked elephant warriors and other beings who serve in this army. எம்பெருமான், தாயாரை தொடர்ந்து நம் ஸத்ஸம்பிரதாயத்தில் ஆசார்ய பரம்பரையில் மூன்றாவதாக இருப்பவர் சேனை முதலியார் எனப்படும் விஷ்வக்சேநர். இவர் எம்பெருமானின் படைகளுக்கு தலைவராக இருக்கிறார்.ஸ்ரீவைகுண்டத்தில் எம்பெருமானுக்கு கைங்கர்யம் செய்பவர்கள் அனைவரையும் அந்த அந்த செயல்களில் நியமிப்பவராக உள்ளார். Among the Azhwars, Swami Nammalwar occupies a pride of place. Maran, later known as Nammalvar and by other names like Satagopa, Parankusa, etc., is considered an avatara of Senai Mudaliar. In the most important festival of Brahmothsavam, the day before the actual commencement is Angurarpanam whence there is purappadu of Senai Mudaliar. He has purappadu on all days of the Uthsavam too. In recent Thai poosam uthsavam too, he accompanied Sri Parthasarathi perumal. On Angurarpanam day, Senai Muthaliyar, accompanied by Nithya surigal is taken in procession to collect mirtigai [sacred earth] for construction of the altar. Here is a photo of Vishveksenar and Nithyasurigal in the purappadu. This morning after dwajarohanam, in the small pallakku, there were Senai Muthaliyar, Ananthan, Chakrathazhvaar and Seshan. On all days during Brahmothsavam, prior to vahana purappadu, there will be purappadu of Senai Muthaliyar for bali at 8 corners. 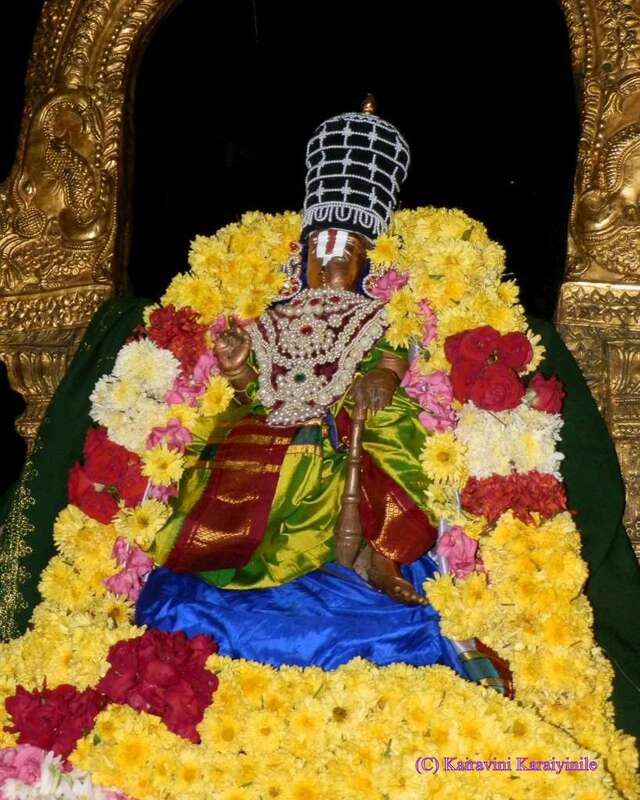 Come to Triplicane and have the blessings of Sri Azhagiya Singa perumal during grand Brahmothsavam. Adiyen Srinivasa dhasan. 23rd June 2018.